Stephen Baamba Albert's Baad is a wonderful CD for $35. This price includes GST, postage and handling. The CD will be available for shipping after March 1, 2015. Produced by Kerryn Tollhurst the album features Broome's master musicians including Stephen Pigram and Michael Manolis. 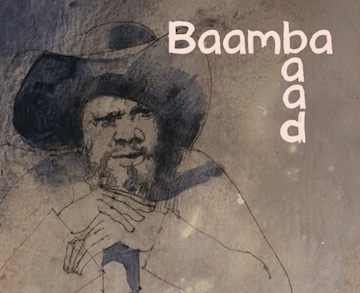 Make a tax deductible contribution to the ongoing recording of Baamba and to Broome's ongoing musical history. "Guitars and ukuleles, squeeze box and mandolins, tea chest bass and mouth organs- these were the sounds I grew up with, living in an old two storey corrugated iron shack, on the the highest hill in Broome in the 1950’s. Played by mum, my uncles and jabuj Louie these instruments were a huge part of the music cultural history of my hometown. The songs on this recording hopefully captures some of the spirit of my musical journey for you to share". Saltwater Cowboy- "My old man, my stepfather who grew me up ,was the one of the last of the Japanese hard hat pearl divers. He had passed away and I had just finished cleaning his body to get him ready for the next stage. On leaving the hospital I ran into my gumbali who had a demo recording of a brand new song from the Pigram Brothers about old pearl divers sailing and singing their last goodbyes –this was played as his ashes were scattered over the waters of Roebuck Bay….I then had the privilege of singing this song live onstage for three months in the Jimmy Chi musical play “Corrugation Road”" . Selamat Tingal/Red Sails SAILS (medley)- "In the sunset, goodbye to you my nona manis –a combination of Malay, Koepang, Anglais –much like the pidgin spoken on the luggers. I can still see them sailing out of Roebuck Bay from the highest hill in town".. Ten Guitars- "… my old uncle Jubudah asked me, while performing on stage at the local pub with the Broome Beats, to “play that song wid big mob guitars”. I replied “ who sing dat song?” he looked at me blankly- so I asked him in ngan-g ( language) “Ange ba amboorinj ??”. He lit up and replied ‘ Yeah dat one now” . I said ‘you mean Englebert Humperdink” to which he acknowleged ” Ng! ng!.. dajim”." Spanish Eyes – "I usec to sing this song in younger days for my two aunties when they were first allowed to come to the pub. They always requested this one". Lucky Ol’ Sun – "I heard Paul Robeson sing this song in my teenage days. A powerful voice and a great storyteller.These days I sing this one for old racehorse trainers". Nona Manis /Tanjung PERAK (medley) - "another of the songs sung in the old pearling days ,usually to the handkerchief dance". Wonderful World - "I’m not really a jazzman but Satchmo was a singer I admired for his charisma and style". Begin the Beguine- "..there was a state ship called “Koojarra” that myself and Jimmy Chi sailed on from Perth to Broome in the 60’s-this song was on the radio every night after the news." Nothing I would rather be – "Tongue in cheeky!!" Town by the Bay "..-in 1907 the St John of God Irish nuns arrived in our part of the country – their influence on the education ,nursing and training on our grandmothers and grandfathers is still alive today. My babbali Jimmy Chi wrote this song to create interest in building a nursing for home for the old people in Broome and I thank him for letting me sing it".